Schools have told The Straits Times they are paying more attention to students' mental wellness, amid a national bid to tackle the problem of young suicides. From peer helper initiatives and talks on mental health to setting up rest corners, some are going beyond counselling to encourage students to speak up about difficulties - whether emotional or academic. Last year, there were 27 suicides among 10- to 19-year-olds - a 15-year high. This was double the 2014 figure, despite a drop in the overall number of suicides. In August, two students from a top junior college killed themselves within 10 days. Last month, a local university student was found dead on campus. Minister of State for Education Janil Puthucheary said in Parliament last month that the Ministry of Education (MOE) was reviewing suicide-prevention strategies. A multi-agency group has also been set up to better understand how young suicides can be prevented. Meanwhile, schools have taken preventive steps. Raffles Institution (RI) has trained 29 students in basic counselling skills and mental health issues as part of a Peer Helper Programme started this year. It held its first Mental Health Awareness Week last year. The event was also held this year. RI student He Zhouzhou, 17, a peer helper, said it aimed to help students understand conditions like depression through booklets, and booths set up in the canteen. Since last December, Raffles Girls' School has set up four dedicated counselling rooms. Previously, counsellors met students in their offices. This year, student leaders started a peer support system to help juniors look after their classes' well-being - such as teaching them ways to handle cliques and highlight problems to form teachers. Anglo-Chinese School (ACS) Independent, which has three full-time counsellors, plans to start a Peer Always Listens programme next year to train 30 to 40 second-year students to be better listeners and spot signs of distress. At Crescent Girls' School, Secondary 4 students attend motivational workshops and are given notes and gifts from other students, parents and the school. 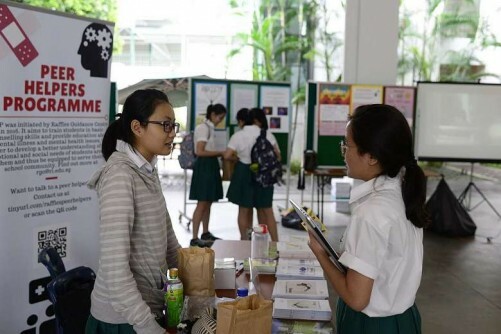 Mrs Tan Chen Kee, its principal, said: "We recognise that O levels are around the corner and stress can build up and when students are discouraged, negativity sets in." Dr Daniel Fung, chairman of IMH's medical board, said some pressures that teens face today are not as "tangible" as before. "It's about how others view them, finding purpose in life - and sometimes in top schools that's more intense." The MOE said it "closely monitors the socio-emotional and mental well-being of our students" by working with schools, families and other agencies to build support networks. "Emphasis is placed on early identification and timely support for students who are in distress before the problem is exacerbated." Teachers are trained to detect signs of distress in students and provide basic counselling support, she said. Parents and students said that peer support is a useful first line of defence, as teens may prefer sharing their struggles with friends. Mr Paul Long, 52, who has two sons in Primary 5 and Secondary 2, said: "It's a good initiative, but peer helpers must also be mature so they themselves don't get affected." RI student Lee Yao En, 17, said: "It can be quite paiseh (Hokkien for embarrassing) to say 'I feel depressed', and this stigma causes people to be less open about it. "But you can't just shrug it off. To the person, it means everything."